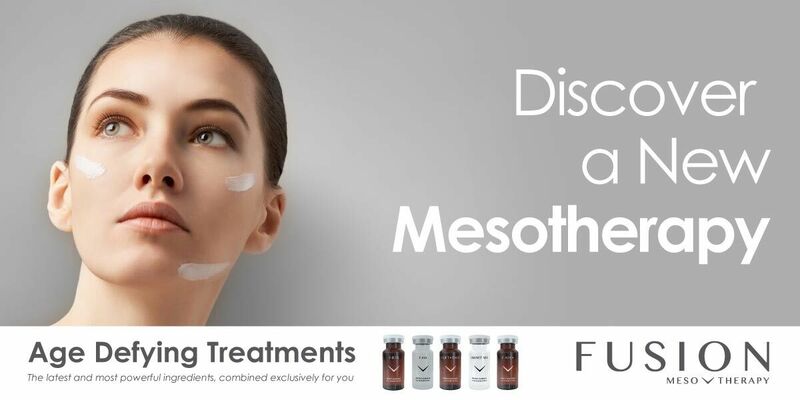 Mesotherapy is a non-surgical treatment that is widely used to rejuvenate and hydrate the skin via micro-injections that are aimed at diminishing problems such as: as wrinkles, sagging skin, lack of radiance, dehydration and sun damage. Caroline our experienced advanced Meso practictioner will mix a bespoke cocktail to treat your specific conditions, which may include a variety of ingredients such as: hyaluronic acid, vitamins, minerals, growth factors and peptides to leave your skin feeling nourished and rejuvenated. Fusion MesoUltimate is the most requested treatment by Celebrities within the Fusion Mesotherapy Nappage treatment range. It incorporates a special cocktail called F-LIFT+FACE which is a potent mix of growth factors and biomimetic peptides. It is blended with a line filling hyaluronic acid for deep nourishment and wrinkle reduction. The results speak for their self, rejuvenation on many levels! Anti-wrinkle, skin firming, stimulation of collagen, skin lightening, brightening and free radical blocker are just some of the many benefits of this treatment. The Fusion MesoUltimate treatment includes the most highly concentrated anti-ageing cream with a serum texture that can also be used around the eyes. t/c all treatment plans must be paid for at the first treatment and following treatments booked in advance. Fusion MesoLift is especially effective over a course of treatments, providing a natural Botox-like and lifting effect. It smooths fine lines, softens expression lines and wrinkles and naturally hydrates and nourishes the skin. A powerful cocktail of vitamins, antioxidants and hyaluronic acid is used to achieve a natural, healthy glow to the skin, reversing the signs of ageing. Fusion MesoGlow is a perfect treatment for anyone looking for instant nourishment and protection. Recommended to prevent, repair and regenerate the skin. Ideal treatment prior to holiday and post exposure to the sun. Radiant skin is what we all look for when attending special events and occasions. Treat your skin to an instant boost of radiance with the Fusion MesoRadiance treatment. This powerful blend of active ingredients provides instant radiance and hydration, bringing your skin back to life. Particularly beneficial for smokers skin or dull lifeless skin. At certain times we all find that our skin lacks hydration and could benefit from additional nourishment. Fusion MesoHydration provides instant relief and moisture, leaving your skin feeling soft and supple. This treatment is especially beneficial over the winter months when our skin needs additional hydration to maintain its natural balance, elasticity and luminosity. Clients are advised that multiple treatments maybe be necessary. The number of sessions depends on the individual skin condition. Three or four treatments may be recommended for mild to moderate acne scarring, whereas deeper scars and stretch marks may require upward of five to six treatments. An interval of 4 to 6 weeks between treatments is typically recommended.